I love hats! Most of the time I find myself loving a beanie in store but then check the price and then quickly turned off by the price tag. This is probably because I've gotten all my hats on sale or I know that I can whip one up myself by crocheting one or just embellishing an old (cheap) hat. I picked up these hats at Target in the mens section for only $3 each! They have a wonderful color selection and they are great because you can fold them or leave them long, like one of Snow White's seven dwarves. This is my favorite beanie that I made out of the three. 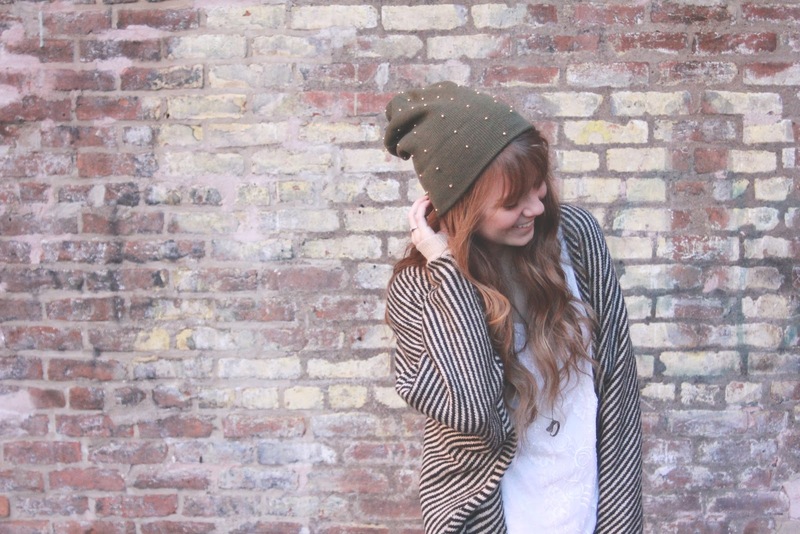 I found this Anthropologie beanie online so I decided to make my own. It looks like it would be time consuming but it ended up taking about 30 minutes to sew all the beads on. Materials: Beanie, Thread, Needle, Gold beads. 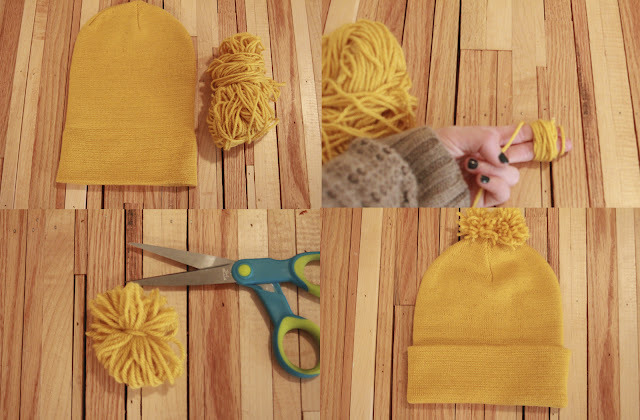 Lay your beanie flat and starting at the bottom corner sew a gold bead on, move up about an inch and secure the next bead. Repeat until the row reaches the top, I suggest following the outline with the hat curving when it curves. Start at the bottom again but in between the first two beads on the first row, this will create an alternating pattern. Repeat rows 1 & 2 until the hat is covered with beads. This beanie is so simple but saves you lots of money! Materials: Beanie, Yarn needle, Matching yarn, Scissors. 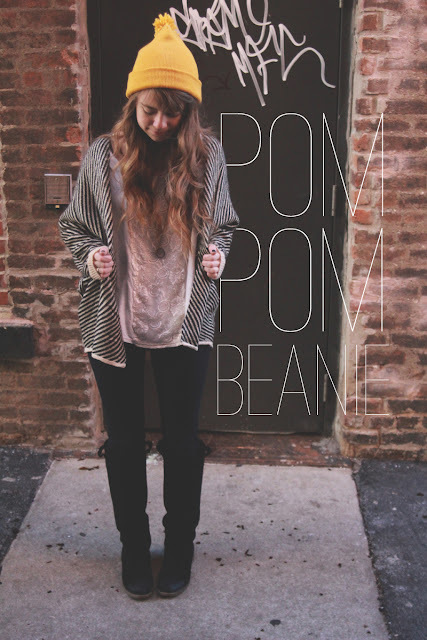 Make a pom pom out of yarn by wrapping it around your index and middle finger multiple times until it is pretty thick (for a larger pom pom spread fingers apart or add fingers). Once the yarn thickness is to your likeness slide off your fingers and tie the ends around the middle of the yarn ball, make sure it is very secure by knotting it a few times. Cut the loops and trim the pom pom ball. Using a yarn needle and extra yarn, secure to the top of your hat! I ended up adding two pom poms for a look of one big pom pom. 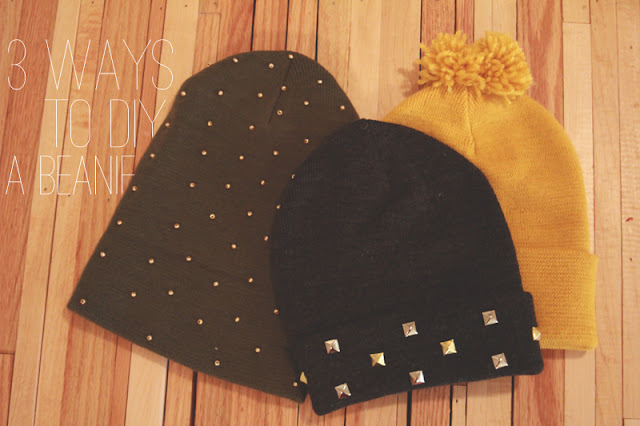 Materials: Beanie, Studs with prongs. Fold your hat and layout where you would like your studs to go. Secure studs. 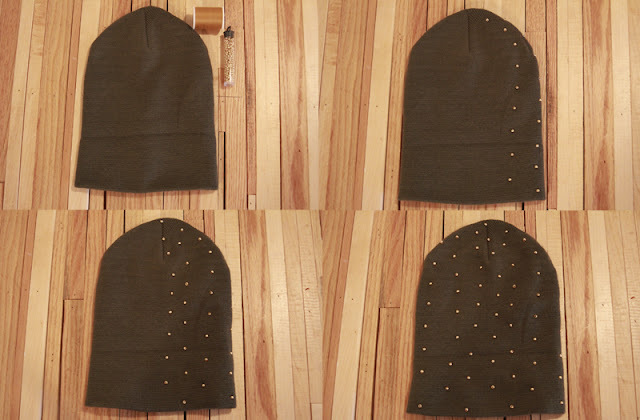 I definitely suggest folding your beanie on this one so the studs don't get caught in your hair. 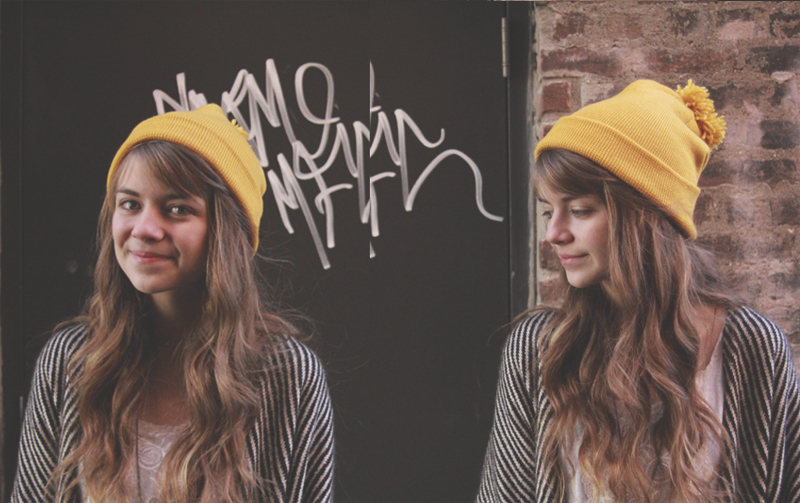 Now you have 3 new beanies for the price of half a store bought beanie! Have fun crafting, today I'll be playing with my new sewing machine all day. P.S. 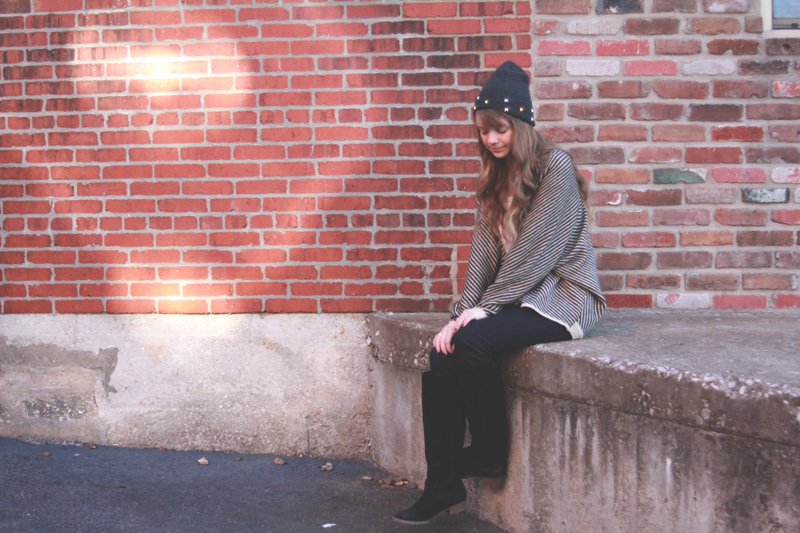 A special thanks to my future sister-in-law Ari for taking these pictures! Oh my gosh. LOOOOVVEEE. Seriously making these. Thanks Erin:) It means a lot, the beaded one is my favorite as well. 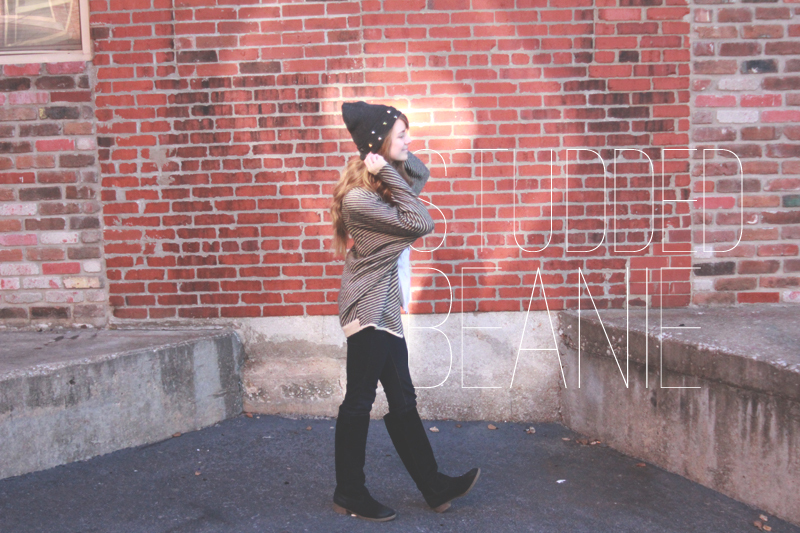 Leah I want to see your beanies when you are finished:) I am in beanie heaven over here. Courtney, this is a great post! 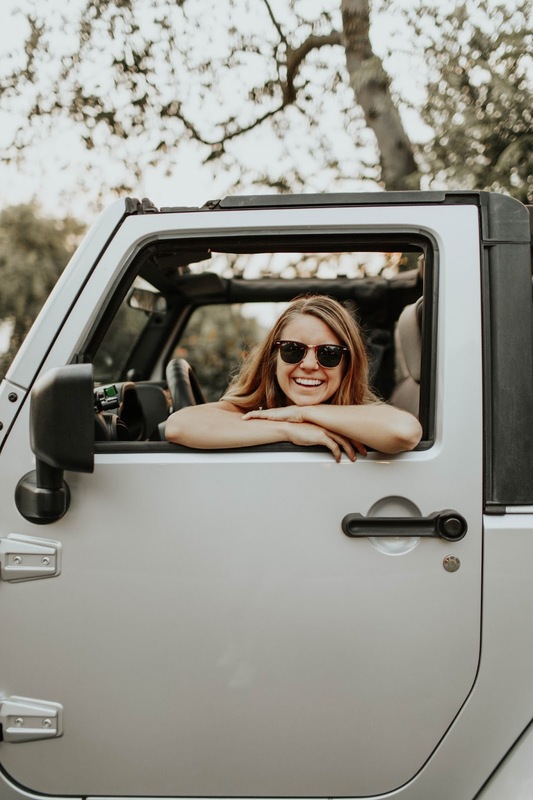 Your writing style is strong and entertaining, these are very easy-to-follow and super fun DIYs, AND the photos you've used are just perfect! Well done! These are all so cute, Courtney! I'm particularly fond of the beaded one. Love this DIY! I can't wait to one of them. It's cheap and so fun to wear something you created it. Thank you so much:) That one is my favorite as well! 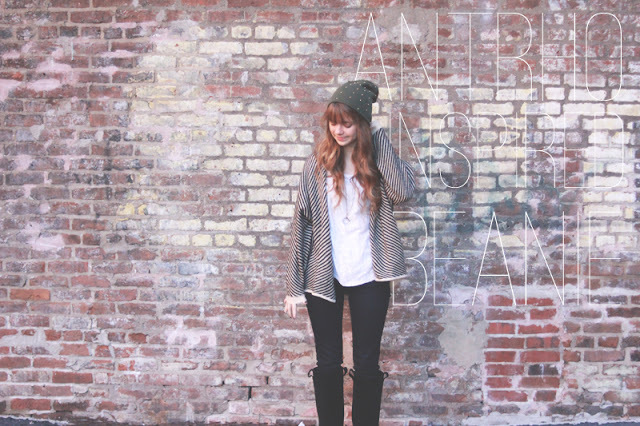 Thank you so much:) I agree, wearing something you make is so much better, not to mention cheaper! These are so cute! Done so well! I'll have to try making that first one! All of these are so fabulous! Loving them and you are adorable!